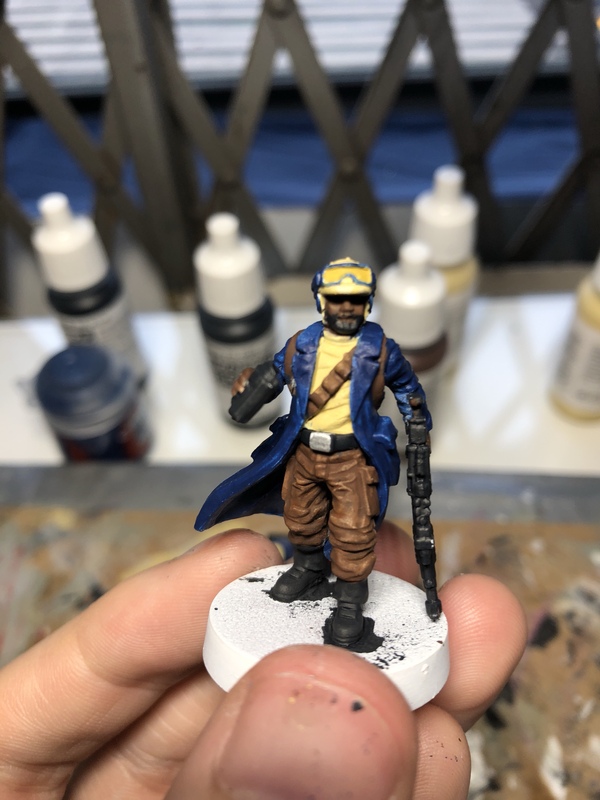 So you've never painted before, and want to know the most basic steps to getting your miniatures ready to put on the table. I'll go over the 5 steps you need to know to make it happen! 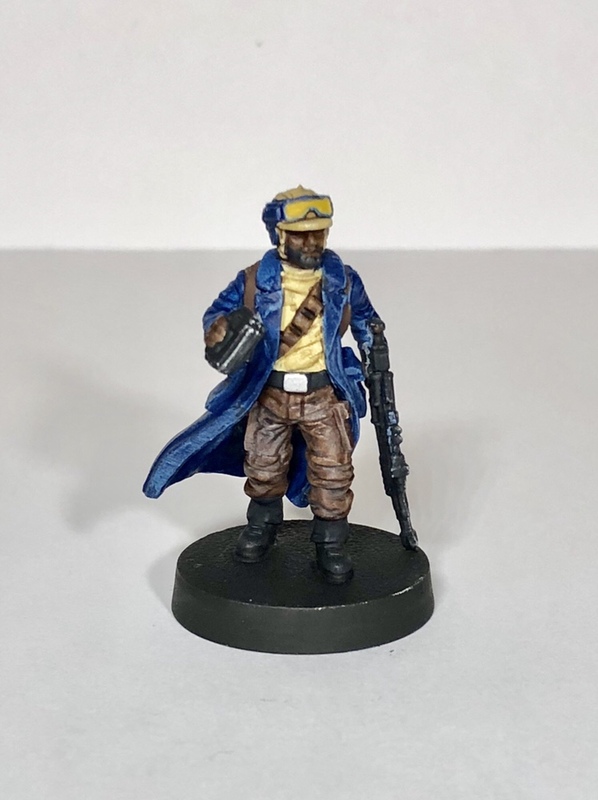 This may well be the longest article I write (at least for now) – a step-by-step guide for Legion players who, like I was, have never painted a tabletop miniature before. Because as it turns out painting miniatures to a reasonably high quality is much easier than it might initially seem. Be sure to check my Buying Guide for beginner paints, brushes, and supplies before you start. All of your Legion miniatures will come in some state of disassembly. For Trooper Units it might require simply connecting the arms or head, whereas Support and Heavy Units (e.g. the AT-ST or the AT-RT) will require a bit of finagling. To begin with, you should only dry fit the pieces on Trooper Units together. This includes Stormtroopers, Rebel Troopers, Vader, Luke, Leia, Veers, etc. That way, you can take arms/capes/components off after you prime them for easier painting. You can and should glue a lot of these pieces on once you’re completely done painting. It’s ultimately up to you whether or not you want to go ahead and glue their feet to the base before priming, but I would recommend doing so. Having something to hold onto as you paint can be very useful, and it’s easy to paint around later. Heavy and Support unit models will likely need some level of gluing and other care before you prime them. The Speeder Bikes, for instance, need to have the front deflector panels and a few other components glued on before priming. You’ll also want to use masking tape to cover the clear support rod or use sticky tack on the end of a pencil or skewer (as seen in Sorastro’s excellent YouTube tutorial). This is also the time to utilize your hobby knife and remove any obvious mold lines, if you so choose. This step is optional, however, as the Legion minis are largely pretty good and most mold lines won’t be obvious from tabletop distance once you’ve painted everything up. When you’re ready prime, go outside or to a well-ventilated area like a garage. If you’ve never primed a miniature before, watch a few tutorials to get yourself acquainted with the process. You’ll want to decide on a color of primer based on your chosen paint scheme. Vader and Stormtroopers are the most obvious: black and white primer works best, respectively. For most other units you can use something like Citadel’s Corax White (actually a very light grey) or Mechanicus Standard Grey. The color of the primer will affect your miniature, so if you want a lighter paint scheme go with a lighter primer and vice versa. Once your primer has dried, it’s time for the most important step: blocking out your colors. But before we get to that, though, a word about paint. Make sure to thin down the paints on your palette with a few drops of water before you use them. This will help avoid any obvious streaks, brush strokes, or unblended lines on your miniature. When in doubt, err on the side of being too thin. It’s much easier to add layers of paint than to take them away. Some painters will tell you to use a wet palette for painting miniatures, but as a beginner you shouldn’t worry about this. A simple plastic palette is perfectly adequate for now. 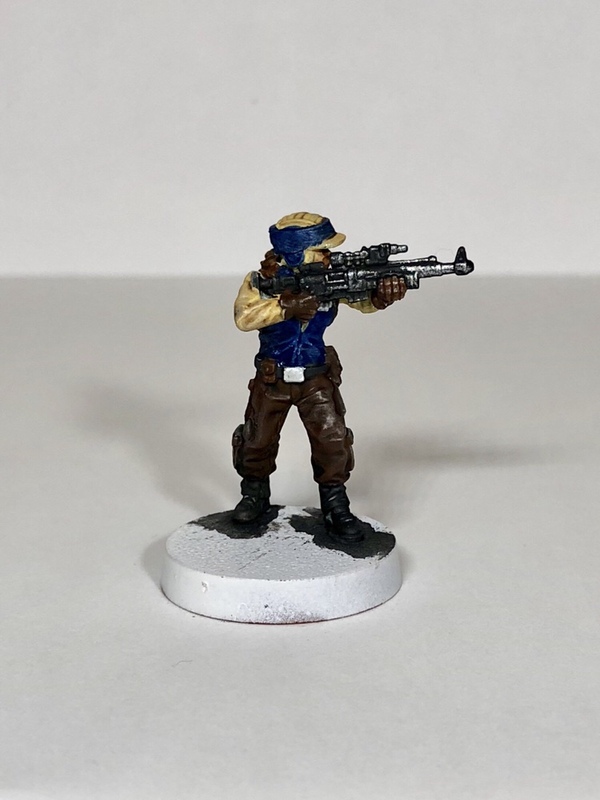 If you’re starting on your first ever paint job, consider picking just one Trooper miniature. Later on you can try out a conveyor belt method (paint all of one unit’s helmets, then their faces, then their guns, etc. ), but until you feel confident in your paint scheme it’s good to get at least one test mini out of the way. Be patient, and work slowly! 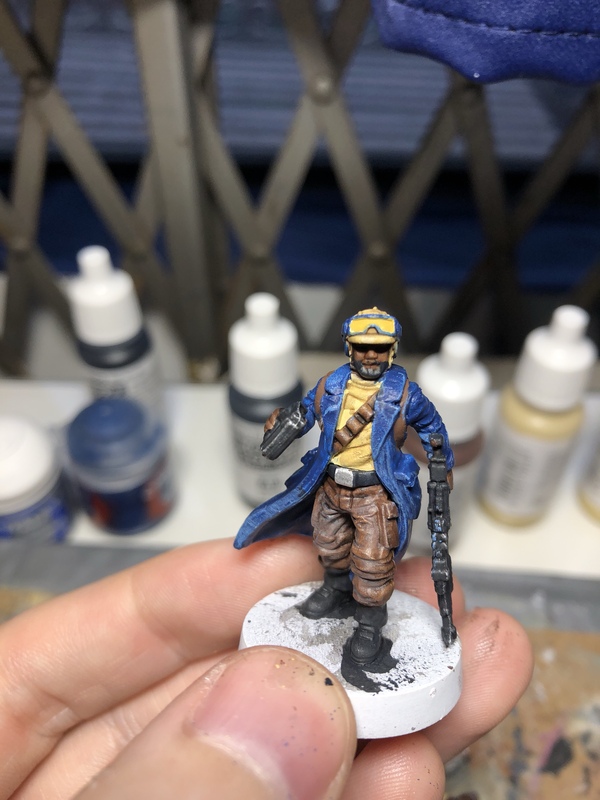 There’s no rush, and if one miniature takes you a few hours to paint that’s totally fine. During this stage, you’re simply doing your best to put the right colors where they should be. If you bleed over (say from the underside of a hat/helmet to the face, an area I’ve always had trouble with) or decide you want to add more detail, you can always go back over it once it’s dry. You’ll want to play around with brushes until you start to get a natural feel for which one should be used when. It’s probable that you develop an affinity for two or three specific brushes and spend most of your time rotating between them. But just like with thinning paints, err on the side of too small, not too large to help limit your own mistakes. Work layer by layer. Since your paints are thin, it may take two, three, or four passes (waiting until after it’s dry, of course) for any area to look completely free of splotches or brush strokes. Once you’ve finished putting color onto your miniature, it’s normal for it to look a little flat. Fortunately, the next two stages will help with that. Now it’s time for talent in a bottle: shading and washing. As I detailed in the Buying Guide, you probably only need one color of wash before you begin. If you’re painting Imperials, opt for Citadel’s Nuln Oil, a black/grey wash. 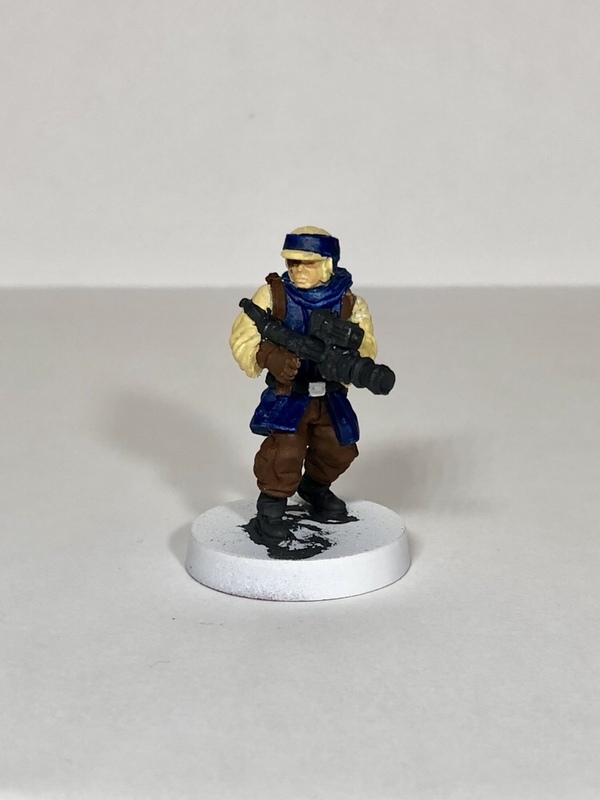 If you’re painting Rebels, go for their Agrax Earthshade, which is brown instead. Unlike normal acrylic paints, washes don’t need to be thinned down before applying them to your mini. Instead, simply dip your brush into the well, dab it a bit on the extended part of the underside of the cap, and apply it generously to your miniature. As you run out of paint on your brush, use it to gently move the applied paint off of flat surfaces and into recesses like folds on clothes or the nooks and crannies of weapons. As this shade dries, it will create some beautiful natural shadows that instantly give your miniature depth and nuance. It’s an indispensable part of the painting process. A warning if you’re painting Stormtroopers: using too much Nuln Oil on all-white armor will make it look dirty and splotchy. You can either be very careful in applying the wash only to recessed areas (such as the weapons, the DLT’s backpack, or the kneepads), or you can buy Citadel’s Lahmian Medium for about $4 and mix it into some Nuln Oil on your palette. Lahmian Medium acts as a thinner for washes, keeping their unique characteristics while also dampening their effect. Mixing it in a 2:1 ratio with Nuln Oil and then washing your mini can create a great shaded look that will easily pass the eye test at arm’s length. Alternately, you can draw on grey lines in recessed areas as expertly shown by Sorastro. Some of the more recessed areas might take longer to dry, so wait for everything to settle and then move on to highlighting. Early on in your painting career it’s probably okay to ignore this step, but there are a few simple things you can do to make your minis pop. Imagine the sun shining down on your miniature. What parts of your miniature would naturally be illuminated? If you’re going for a top-down approach, the top of the head and shoulders certainly would be, as well as the tops of any exposed pouches or backpacks. Raised edges of armor pieces would fall under this as well. By mixing in a little bit of white paint to whatever color you used to paint that portion of the mini, you can apply a couple of thin layers of that color (or in an increasingly lighter gradient) as Sorastro does in his YouTube series. Alternately, you can use a technique known as drybrushing. To do this, put a little bit of paint (colored reasonably lighter than the original) onto both sides of a completely dry brush slightly wider than you would normally use, with a squared off edge. Then, wipe this paint off onto a paper towel or the back of your hand until barely any paint is remaining. Once you’ve done this, simply flick the brush lightly back and forth over the appropriate area of the mini to capture any exposed edges and give them a quick and dirty highlight. This works especially well with light grey or metallic silver on dark grey or black weaponry. It gives it a great pop that suggests a metal surface instead of a plastic one. …and after. The difference is stark! I’ll get to all the cool ways you can make a scenic base in a later series of posts, but for now we’re left with the question: what do I do until I’m ready to try scenic basing? The answer can be found in step number two: color block. As of right now, all of my Imperials have a Lothal-themed base, while my Rebels are stuck on Scarif. Before I dove into scenic basic, however, I had a much simpler plan. I painted the surface of each base a solid black, and then painted the side a specific color. Red for all of my unit leaders (including single mini units like Vader and the AT-ST), then a scheme-matching color for all of my non-leader units (e.g. white for Stormtroopers and brown for Speeder Bikes). This is an easy and effective way to finish off your minis and make them stand out on the table. It obviously won’t give them quite the same pizzazz as a fully realized scenic base, but the good news is that with a simple color blocked base you have ample room to redo them later on without any fuss. Of course, you could also be forgiven if you simply painted all of your bases stark black. Black is always in season. Last but not least, you’ll want to protect your minis. These beautiful creations of yours will be subject to all sorts of abuse from your oily fingers, transportation to and from tournaments, and all sorts of other natural factors. But keeping them in great condition is just as easy as priming them. I personally have only used Tamiya Dullcote – and to great effect – but any similar product will do. The key is to look for lacquer or varnish that has a matte/flat effect (if you don’t want it shiny, as in the majority of cases) or a gloss effect (if you do want it shiny, an option for Stormtroopers). Make sure to give between 24-48 hours between your final painting and your spray varnish, then use your product like you would a primer. Once it dries, it will look just as bright as before but last significantly longer. My very first Legion miniature. And there you have it: five steps to table-ready miniatures. Remember, too, what table-ready means. 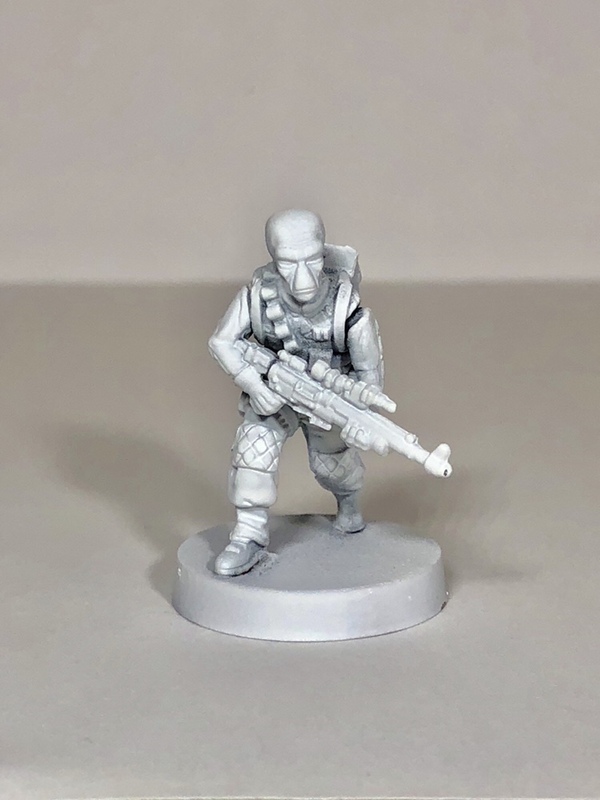 You’re going to be spending a lot of time with your miniatures a few inches away from your face, but that’s not how you’ll see them on the battlefield. A lot of those small imperfections will be entirely unnoticeable once they’re grouped together on the board; they might even give your units some character. A good rule of thumb is to hold your mini at arm’s length – that’s what it will look like on the board. Over time, you’ll begin to get a feel for what works best for you – habits, products, and styles alike. Take a picture of your first miniature, and look back every so often to see how you’ve improved. Don’t be afraid to share your miniatures with others (I’d love to see them!) on Facebook, Reddit, or in your own personal circles, and ask for feedback when you’re ready. You can do this. Even if it takes you a couple of tries to get the hang of it. Really, any if not all of Sorastro’s videos are godsends for the beginning painter. He’s great for inspiration and reminders, and you can usually find him lurking around the biggest Legion Facebook groups as well. Got any other tips, tricks, or suggestions? Leave them in the comments for others to find!